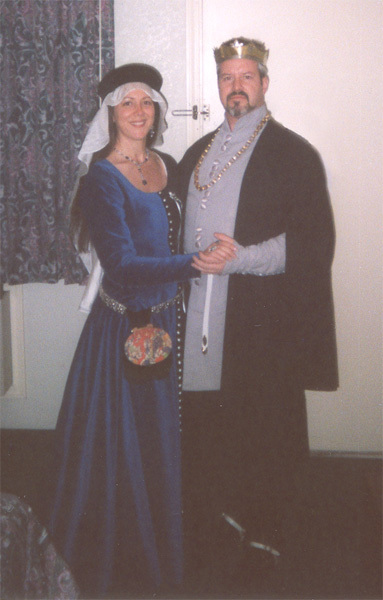 I am a member of the Society for Creative Anachronism (SCA). The SCA is a non-profit educational organization that researches and recreates the better parts of the Middle Ages and Renaissance time periods. Technically, this includes anything that is pre-1600. Generally, though, most people stick to the 600-1600AD time period. 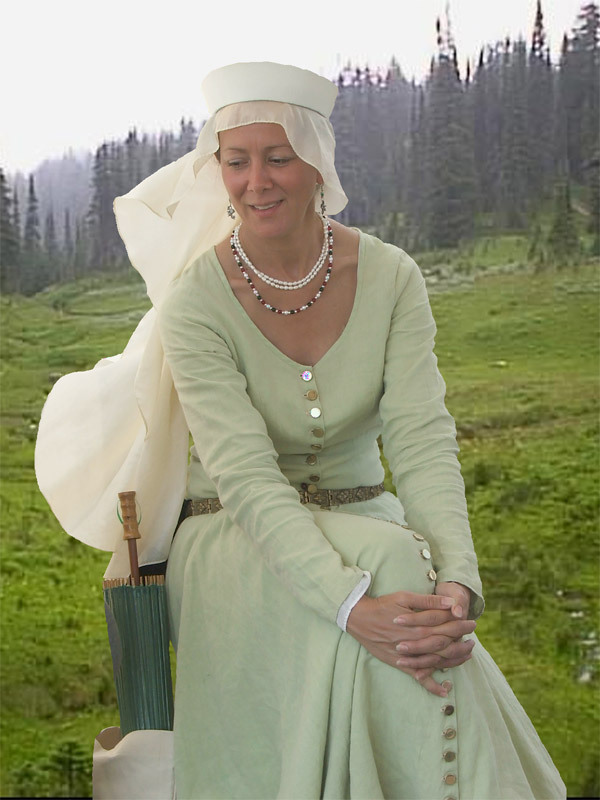 When I step into the Current Middle Ages, I become Lady Anne Marie deGarmeaulx. I realized that so many of my pictures are on paper so I guess I have to spend some time scanning them all in. I'll try to get to that someday soon. 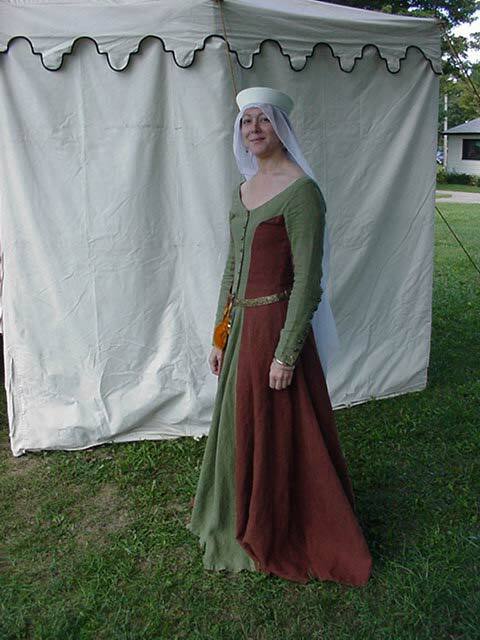 At the 2004 Fall Crown Tourney in a new heraldic cotehardie (in Dag's colors) made of cotton velveteen. Dag in his new garb. 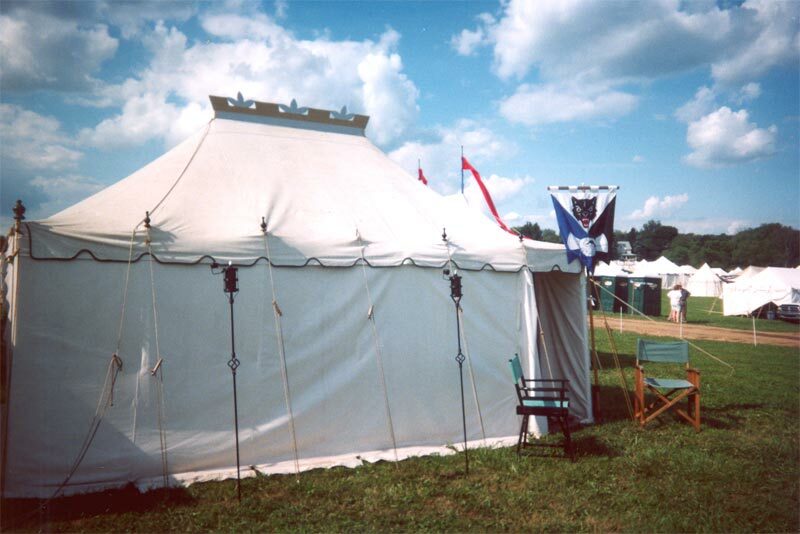 The exterior of our pavilion at Pennsic. 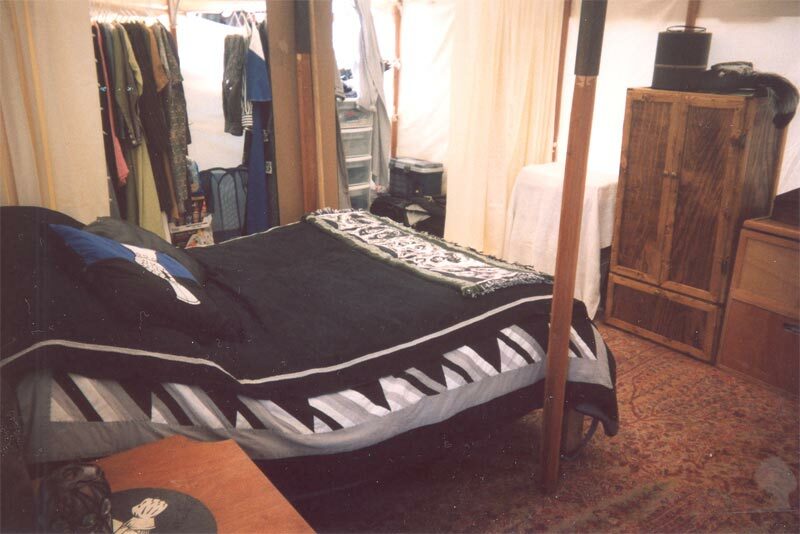 The interior of our pavilion at Pennsic. 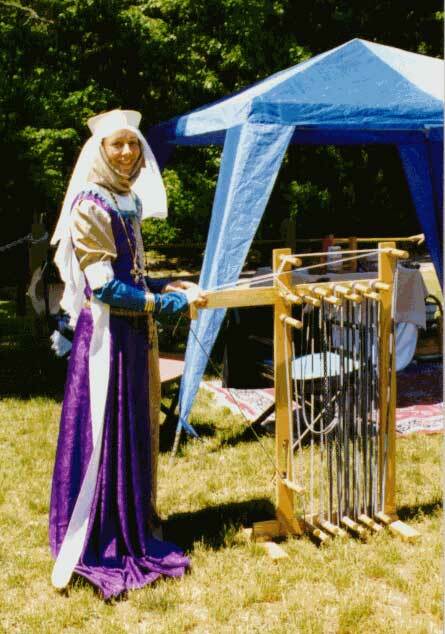 At the 2004 Spring Crown Tournament in a new heraldic cotehardie made of dupioni silk. 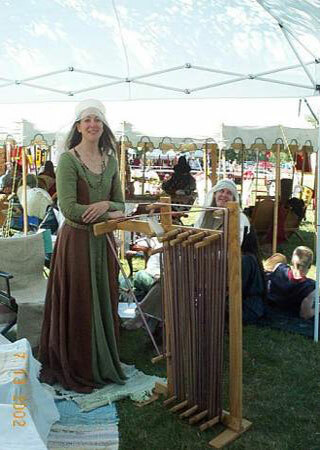 Same gown as above with my inkle loom at the 2002 Saline Celtic Festival. The links below will take you to the society and local group web pages should you be interested in learning more about this game we play. 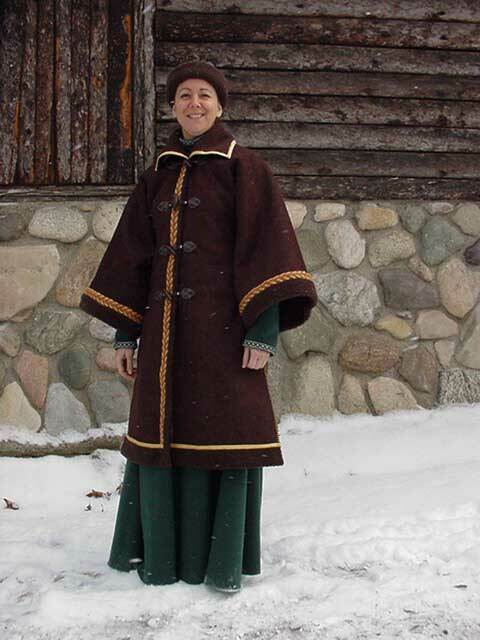 There are also links to other pages I visit or find interesting or useful to someone in the SCA. I have a whole bunch of sites that I need to put in here. Many people in the SCA develop a story around the persona they portray. This persona is not a person who actually existed in history. Rather, it is a person who could have existed in the Middle Ages or Renaissance time periods. A "persona story" can be something as simple as, "My name is Sven and I like to dance." At the other end of the spectrum, a persona story can be as elaborate as a novel. Most people fall somewhere in between. My own persona story is just a basic one. 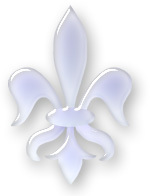 In the town of Arras, in France in the year 1383, I was born. I was named after my mother, Anne, but my father always affectionately called me Anne Marie, after my mother's name and the Holy Virgin Mother. My mother had given birth to two sons, one (prior to my birth) who died at the age of fourteen months and one (after my birth) who died at the age of three. 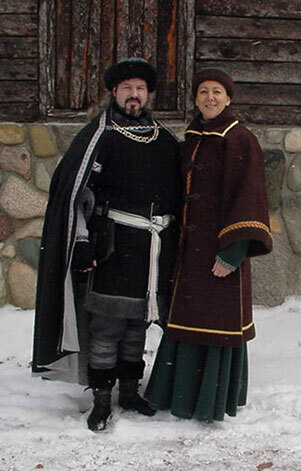 My father was a merchant who dealt in textiles, mostly tapestries, and traveled frequently so my mother and I were often sent for extended periods of time to be left in the care of my father's cousin and her husband, Philippe the Bold and Margaret of Flanders, the Duke and Duchess of Bourgogne. The Duchess practically raised me as her own and, with the consent of my parents, saw to my education including reading and writing French, English and Latin. In this, my mother and I learned together. 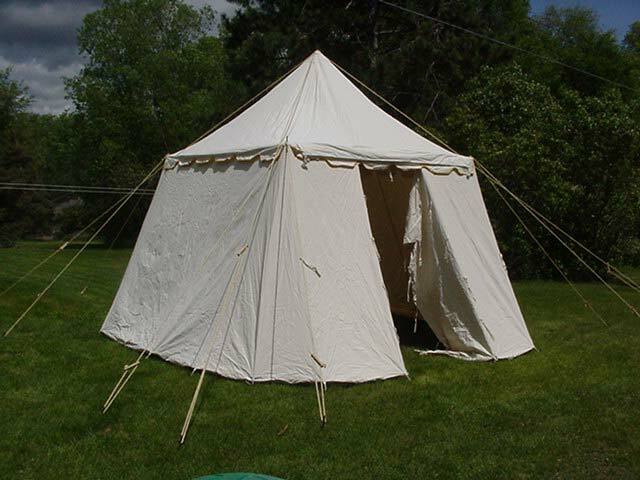 I learned courtly arts and crafts from the Duchess and her ladies and got a head for business from my father as he would tell me his tales when he would come home. My mother took care of teaching me the womanly arts of household management. When I was seventeen, I was given in marriage to Pierre de Garmeaulx from Rennes, the second son of Sir Robert de Garmeaulx. At the time of the marriage I took his name. The next summer my father died a happy and wealthy but very old man. The estates of my father went to my mother but under the executive direction of the Duke. Sadly, I was unable to conceive until my 24th year at which time our joy was restored upon the birth of our first child, a daughter. Two years later a second daughter was born. Once again a daughter was born three more years later. We, my mother, my husband and daughters, lived in Brancion in the manor that had belonged to my father's family, located near the residence of the Duke and Duchess, and remained there after Philippe's son, Jean sans Peur, became Duke in 1404. Pierre divided his time between responsibilites to the Duke for training the local boys in the arts of war and managing the thriving tapestry business left behind by my father. When the English army headed by Henry invaded, my husband traveled north to join the battle and lost his life at Agincourt trying to save France. My mother, daughters and I moved back to Arras, to the town of my birth. In the years that I have been a widow, I have done my best to manage what is left of my father's business. My daughters continue to be a joy and my mother is still strong and healthy. We are happy and enjoying our life together.